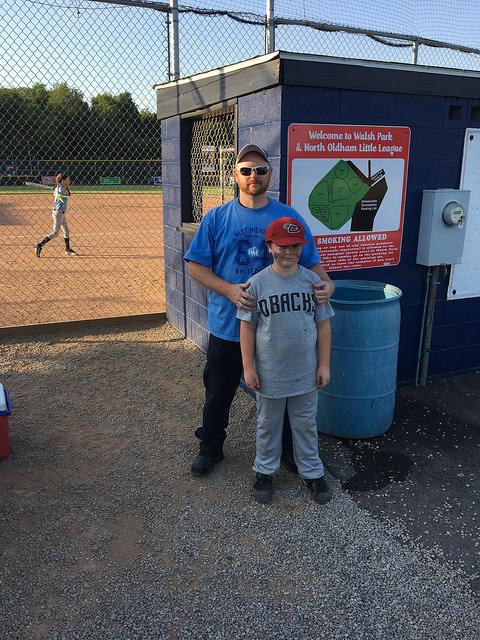 Walsh Park-LaGrange, KY: Brian’s back with another season of Little League baseball, and he’s back with the Mariners this season (completely different team and coach, but he had success last time, so he’s happy). The season started in April, but like most of the country our April was full of rain, snow, high winds, and all around crappy weather, causing many games to be postponed. The boys are just now starting to play catch up on the first part of the season, sometimes seeing three games a week. The Mariners are 4-4 as of this posting, so they’re playing respectable ball and keeping in the hunt. A couple of games got away from them and I think they’re better than there record so we’ll see how the next half of the season turns out. Brian is doing well at the plate. 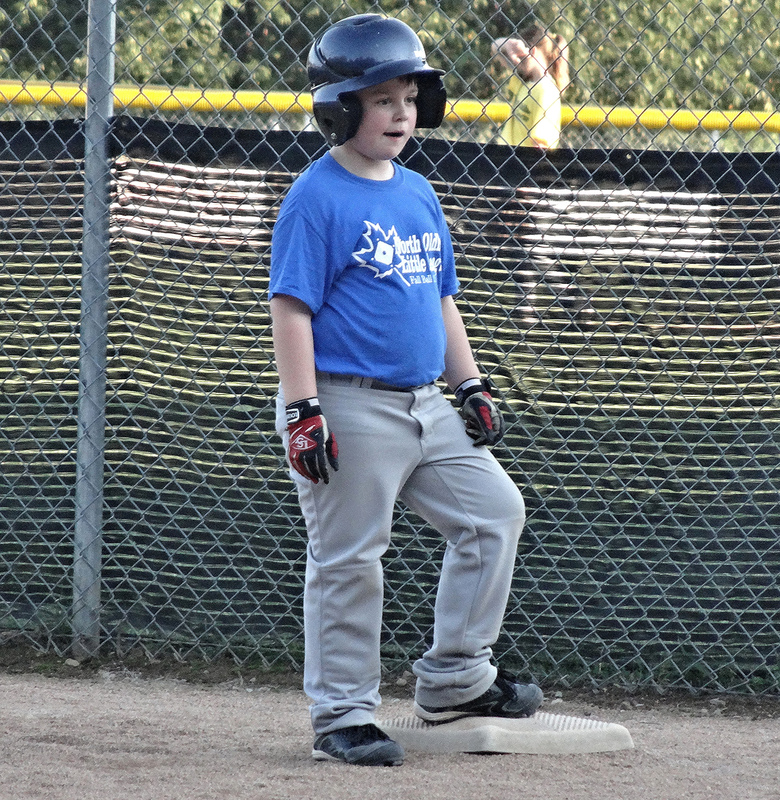 He’s had four hits in his last three games, and has some RBI’s and runs scored thrown in there. In the field he’s done well, but still frustrated at being stuck in the outfield most of the time. The coach has talked with him and tried to keep him positive, but the season is warring on him already. Hopefully he’ll get to see some action at first base sooner than later, as that’s where he likes to play and can catch the ball pretty well. He’s got good coaches this season and they are very patient with Brian’s colorful roller coaster of emotions. Keeping him positive is the key, and when he does well and has confidence he’s very productive and has fun. 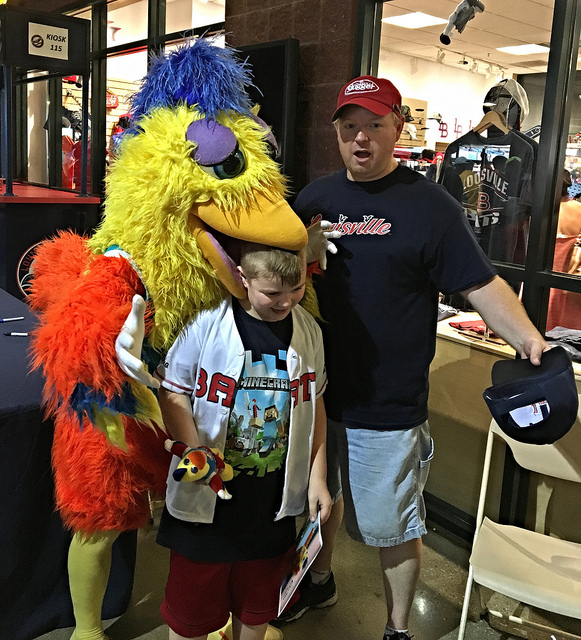 If he can learn more about the game and let himself have a good time, that’s what it’s all about! 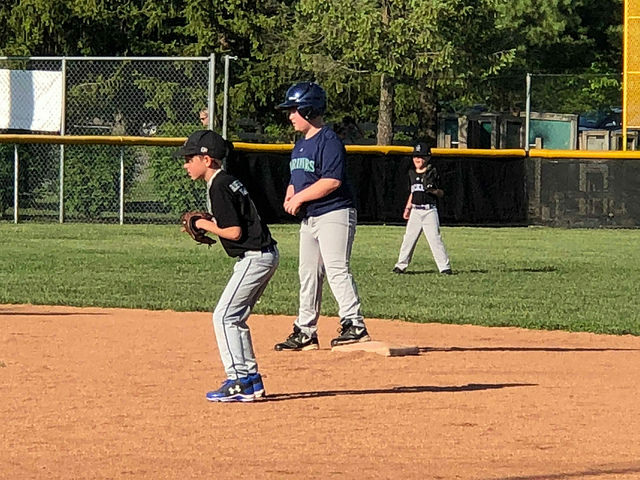 Walsh Park-LaGrange, KY: Despite the fact that practices started in the summer, and, wait, I think technically it still is summer, but fall baseball has started at North Oldham Little League. After a disappointed spring, I had to really convince Brian to play here in the fall. 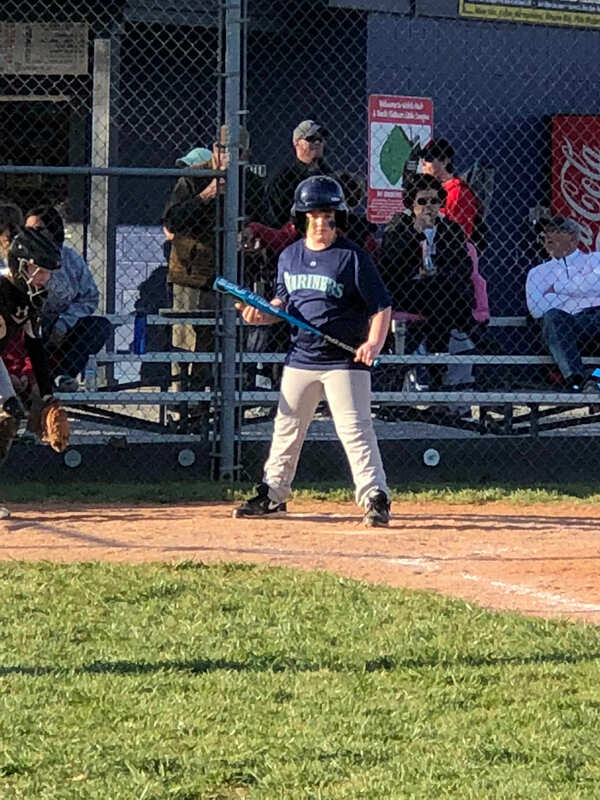 Being this is his first experience with other kids pitching to him, I thought this was a very important step to prepare for next spring. 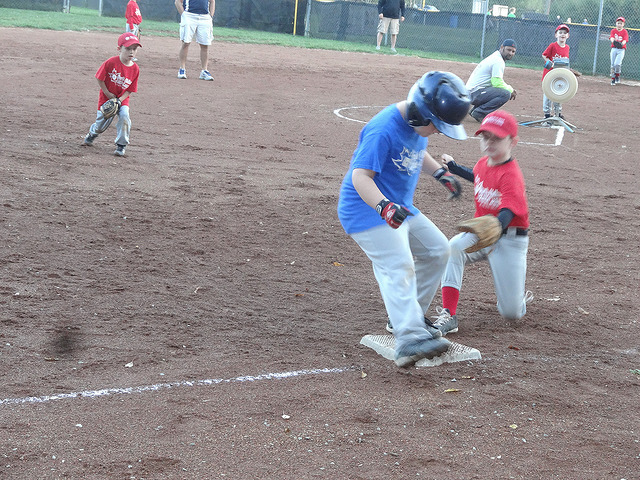 Walsh Park-LaGrange, KY: That’s all she wrote for this season of Little League baseball. Not much changed from my last entry, as it continued to be a frustrating season for Brian and his team. 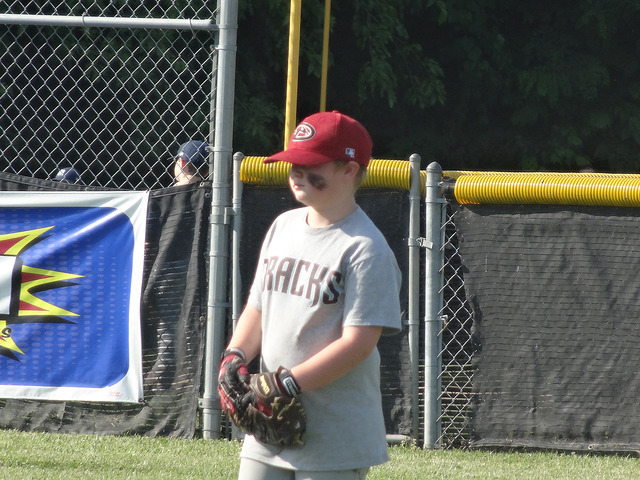 The Diamondbacks ended the season 5-14, good for eight in the 10 team league. 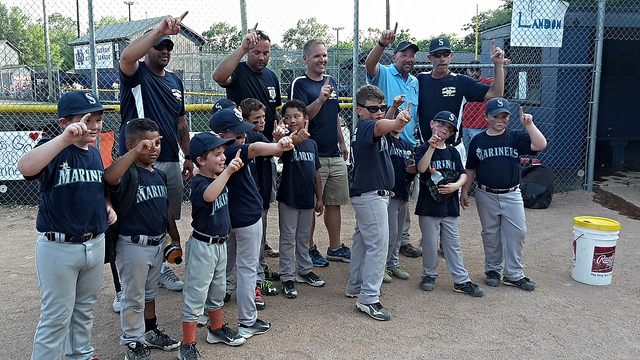 The D-backs also bowed out in the first game of the playoffs, so a very different end to the season as Brian was hoisting a championship trophy at the end of June last year. The old saying is, that you can always learn more by losing, and if that’s the case then that is definitely the silver lining for this season. 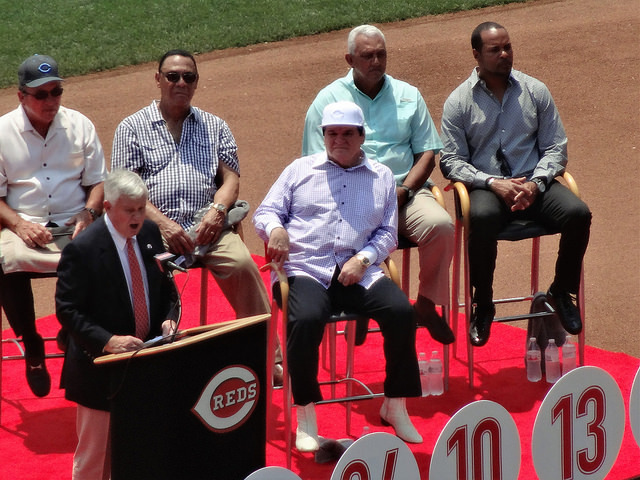 Life parallels baseball so much, and there are so many lessons to be learned. Sometimes you work hard and get a hit or make a solid play. Sometimes you miss one, and you have to put it behind you and work a little harder on the next one. Life, as in baseball isn’t always fair. You don’t always get what you earn, and sometimes you even get called out on a strike below the knees. That being said, he still had a very good season, and I’m very proud of the way he played. He still hit over .500, which is impressive even off of a hitting machine. 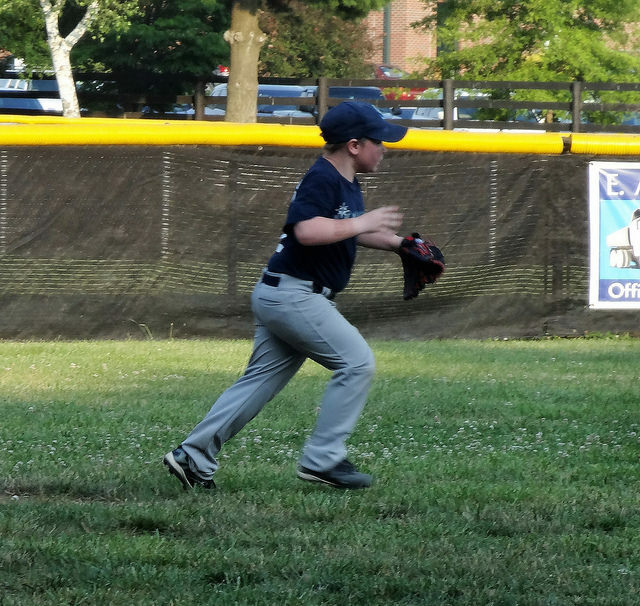 He improved on his catching and fielding, but we still need to work on throwing mechanics. Brian showed a better overall understanding of the game, where the play was heading and where to throw the ball if it came to him. At times during the season, Brian also showed signs of being a good leader on the team, cheering on his teammates and keeping a positive attitude, and I’m very proud of him for that. I really think he enjoys the game, too, as every day he asks if we can play catch or play one of our ‘Brianball’ games out in the yard. 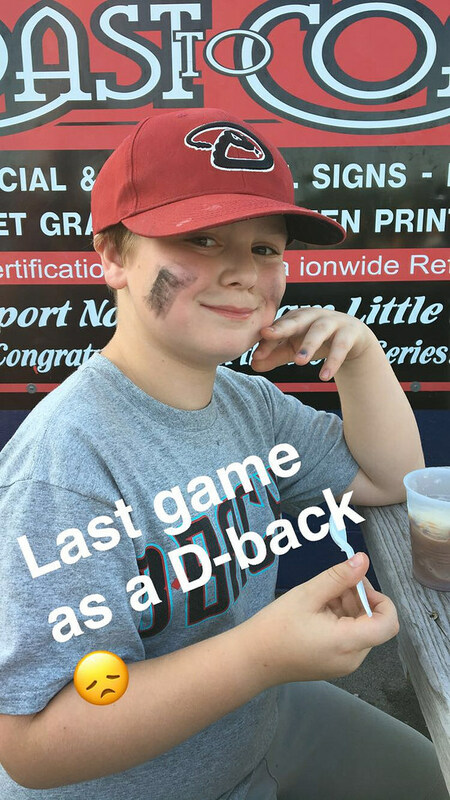 Fall ball starts up here the end of August and he’s looking forward to that, but I think he’s happy this small chapter of his baseball career has come to an end. Back to Brian’s season. 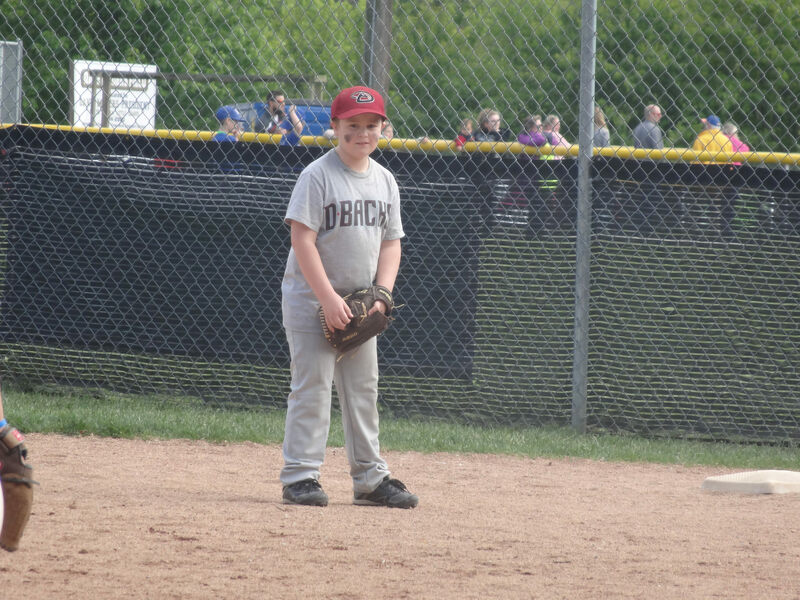 He’s been stuck in the outfield most of the time, which he doesn’t like, but has made the best of it when he gets his chances in the infield. 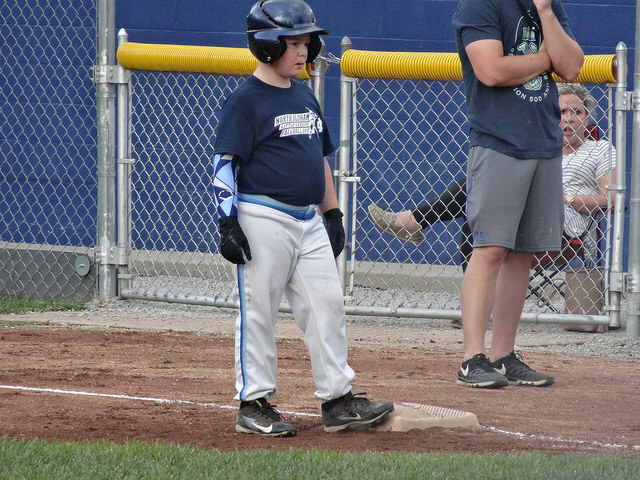 He’s played some pitcher, second base, and his favorite: first base. 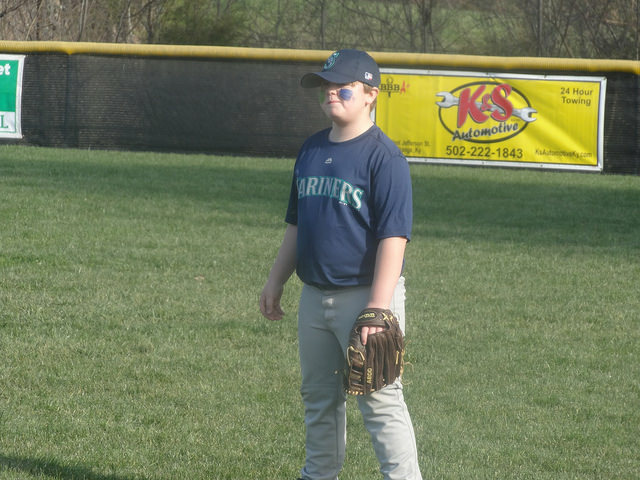 He did well, and caught everything that was thrown to him, but only got to play there one inning so far this season. He’s keeping his chin up, though, and I’m teaching him to only worry about the things he can control, and do his best wherever the coach puts him. 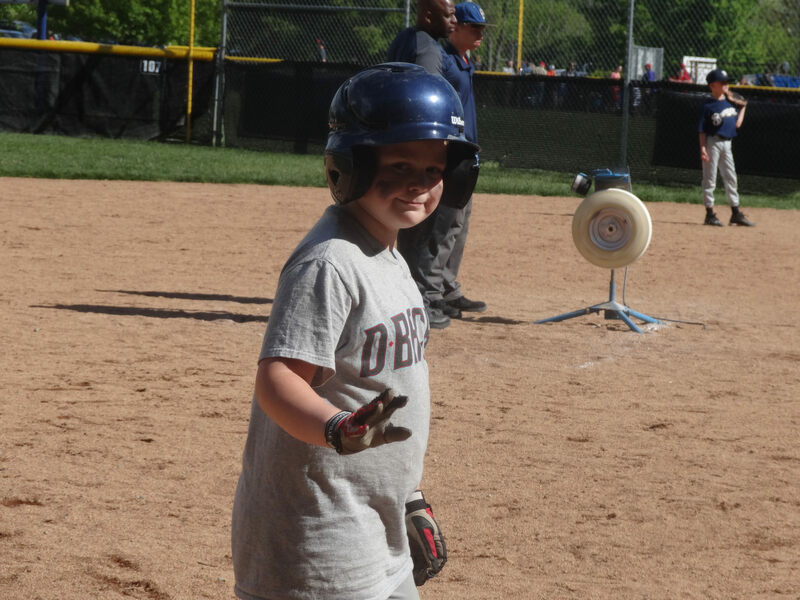 He had the chance to catch a couple of innings, though, but didn’t end up liking it. 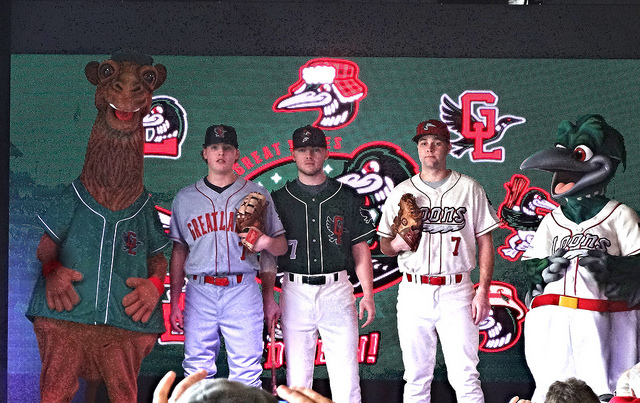 The mask didn’t fit well, and he took a couple of pitches in the foot. 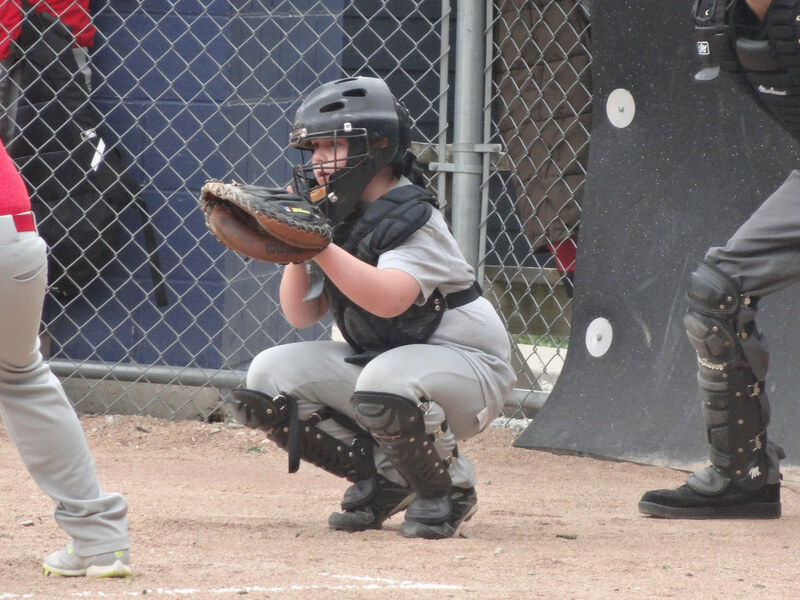 Maybe I can talk him into being catcher again later on in fall ball. He still has half a season left, and as long as he keeps doing his best and having fun, we’ll call it a win! 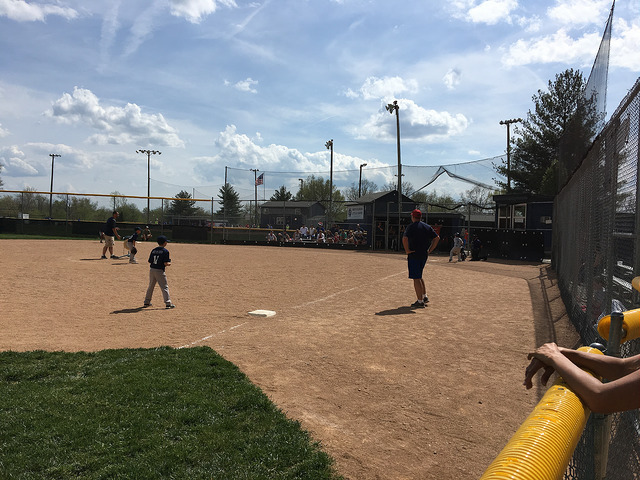 Walsh Park-LaGrange, KY: How nice is this, that Brian is playing outside in nice weather? In April! 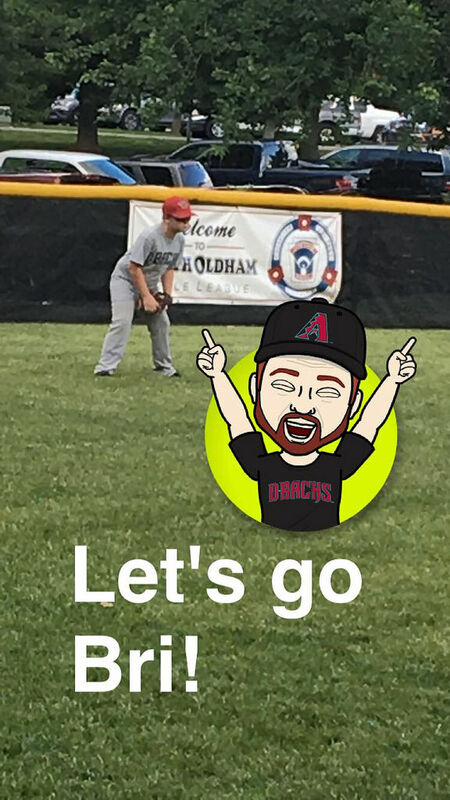 Brian’s back in Rookie ball this season, this time suiting up for the Diamondbacks, and ready to pursue another championship. 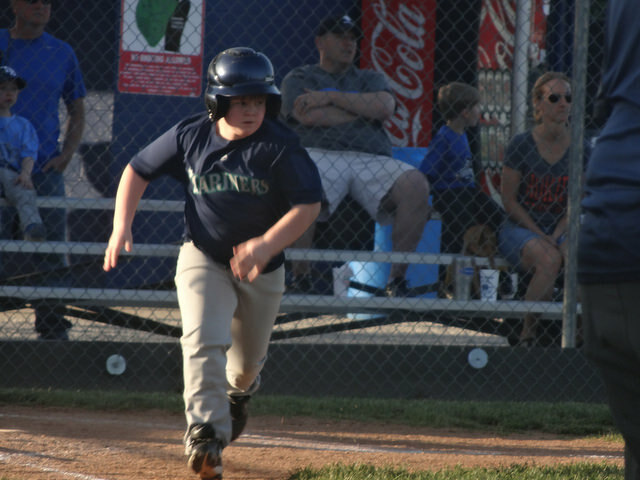 The North Oldham Little League does a great job promoting itself, and has a pancake breakfast and parade to kick off the season. 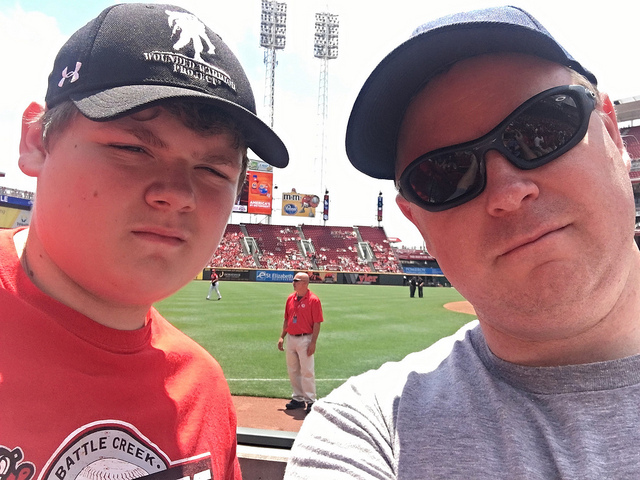 Unfortunately, do to work, we were unable to make this early morning festivities, but he’s made the two out of the three games so far (Tuesday night we had tickets to WWE Smackdown Live that we bought well in advance). The first game of the season the D-backs won 13-4. 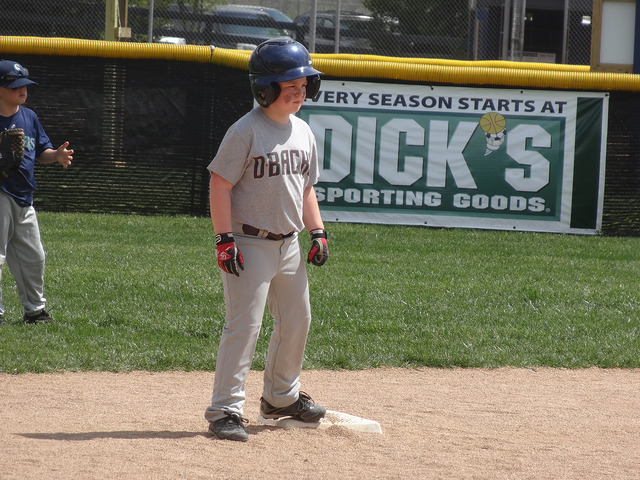 Brian went 2-3 with an RBI at the dish. 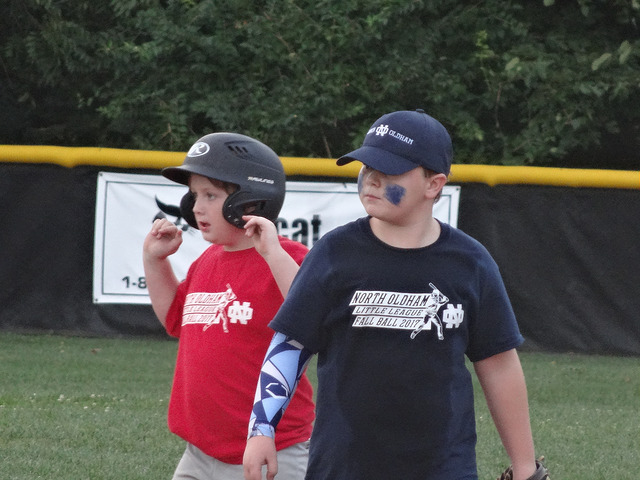 In the field, he made some nice plays and had some good catches to pitch in defensively. 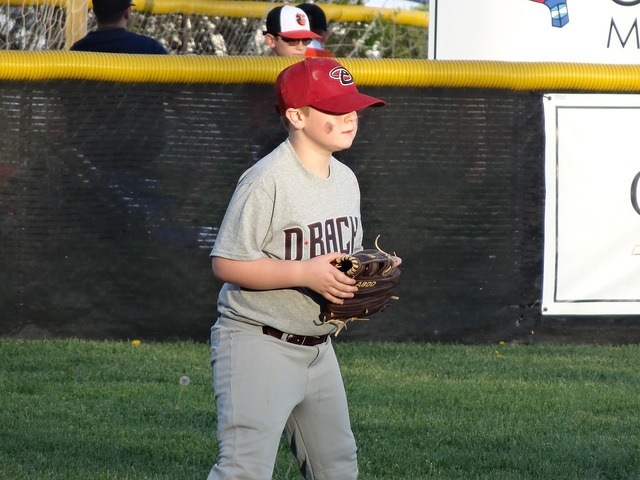 In the second game, the D-backs held on to win 6-5. 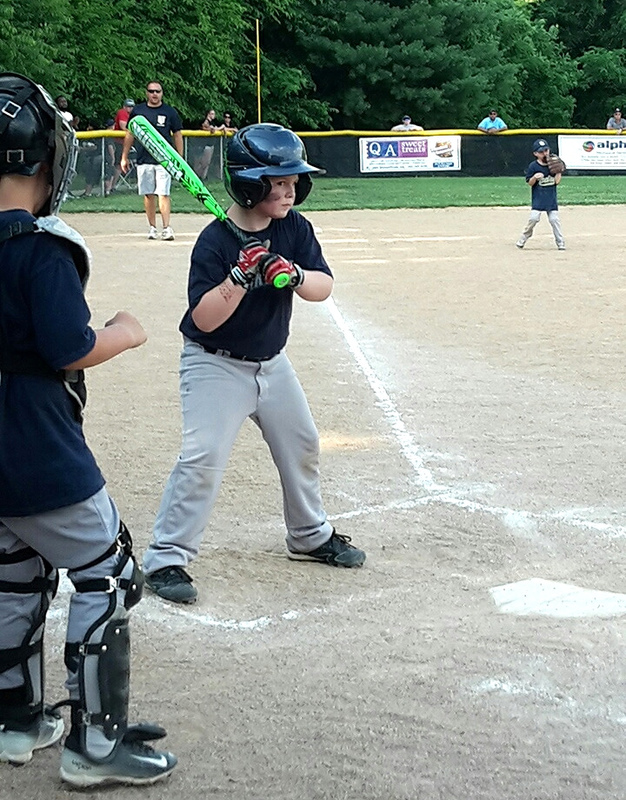 Brian scored the game-winning RBI in the fifth inning on his second hit of the night. He was 2-2 with two ribeye steaks. 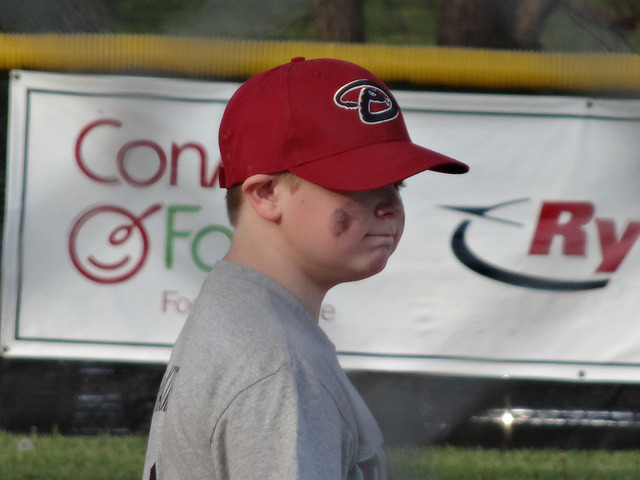 He didn’t get anything hit to him in the field, so he was actually mad after the game. A little ice cream cheered him up, though. I’ll probably kick out a mid-season report in a few weeks! 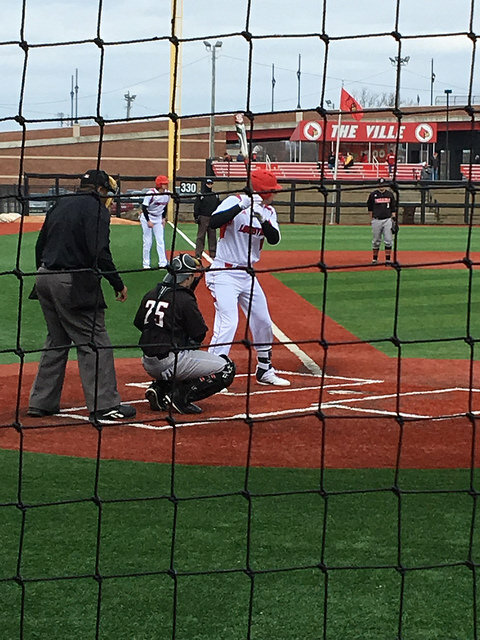 Jim Patterson Stadium-Louisville, KY: It officially begins, the 2017 baseball season. As it was, Saturday was the coldest day here in Louisville, so obviously, that’s the only game we were able to make. 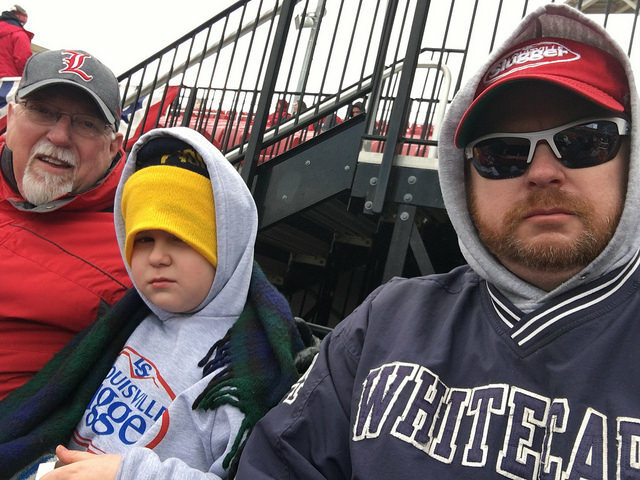 A little cold weather isn’t enough to ruin our baseball fun, however, (even though Brian looks miserable in the photo). 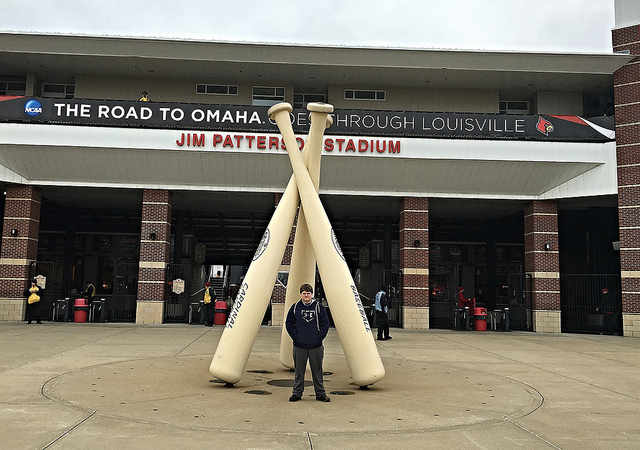 With Papa down visiting from Michigan, we were all happy to be at Jim Patterson Stadium for our first ballgame of the year. 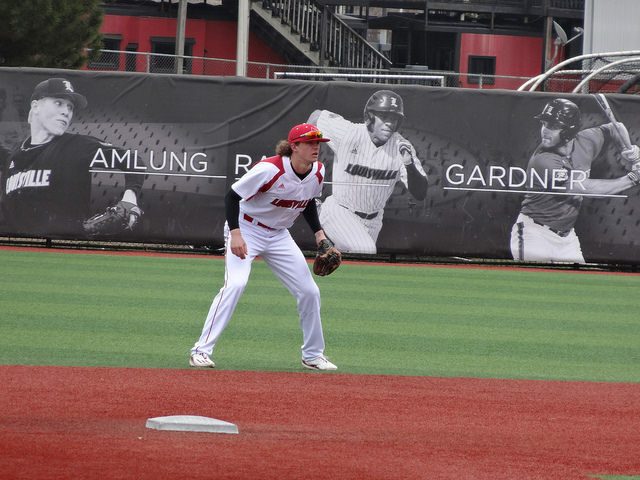 On the hill for the Cards, Kade McClure earned the win, pitching six innings while striking out nine. He only gave up one hit and walked only three. 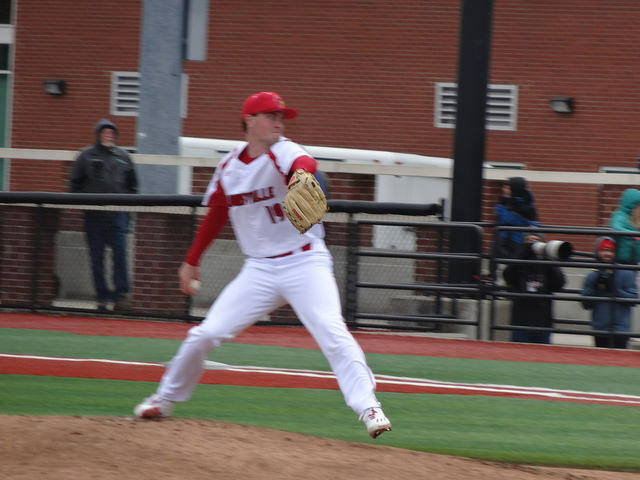 In relief, Sam Bordner and Shay Smiddy preserved the shutout for Louisville. 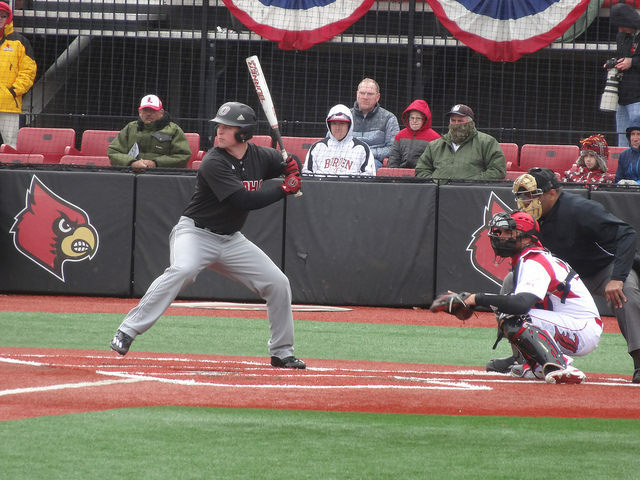 On the offensive side, Louisville was led by Colby Fitch, who went 2-4 with two runs scored and an RBI. Also, Brendan McKay was being Brendan McKay, going 2-2 with a run and an RBI, while Drew Ellis went 2-3 with a run and RBI, also. Nebraska-Omaha didn’t do themselves any favors, either, committing four errors. 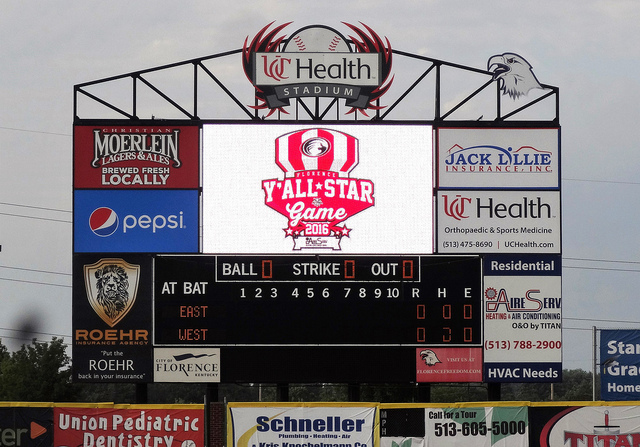 In the end, it was a blowout and a shutout for the Cardinals. Final: Cardinals 10, Mavericks 0. 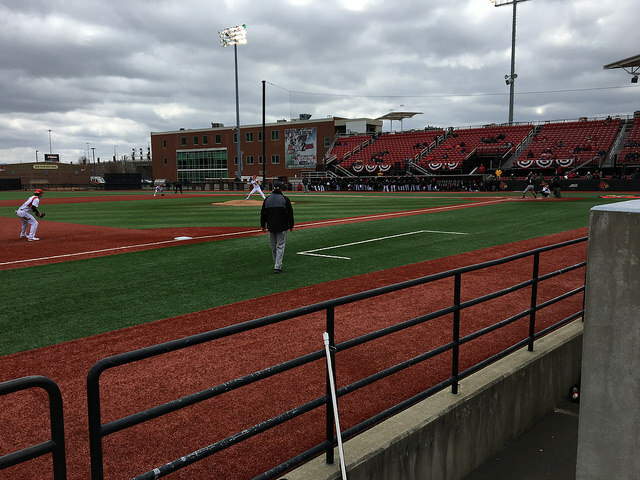 Despite the cool temperatures, it was a fun day of baseball, and it wasn’t over with the Cards. 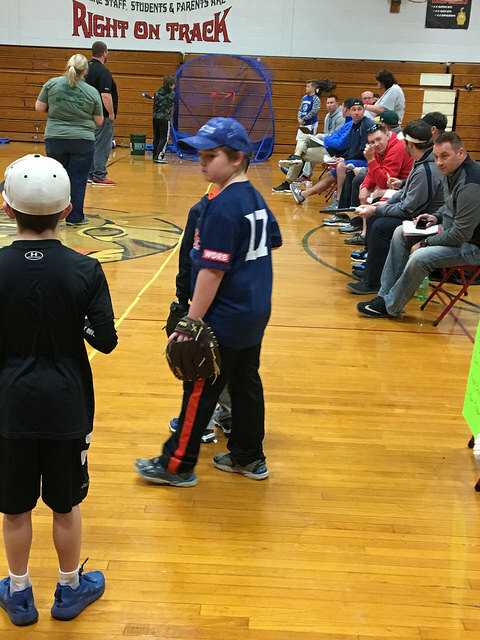 We had to rush back to the OC, so Brian could take part in his Little League evaluation, as the draft was on Sunday. Here’s a photo below from his eval. Not sure when we’ll see Louisville at home next, but have plans to visit Lexington in a couple of weeks. 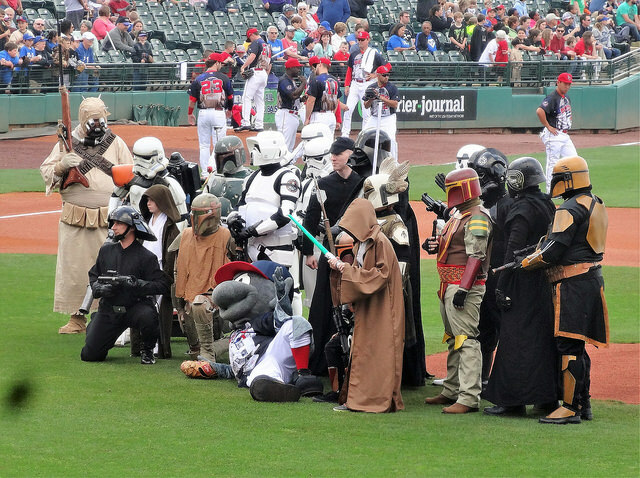 As for me, I’m just glad the baseball season has begun. 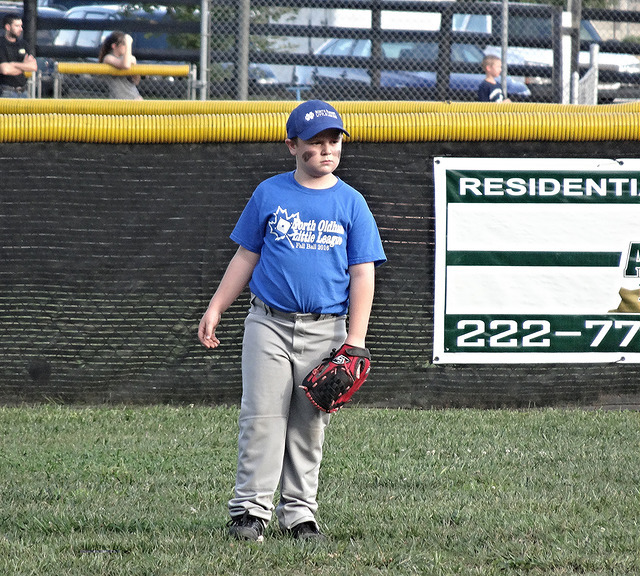 Walsh Park-La Grange, KY: It seems as it just started, but Brian’s fall ball league has come to an end. I’m really happy that he chose to keep playing, and I think he had a good time. Honestly, I really didn’t pay too much attention to his team’s record, although I’m pretty sure they won more than they lost, and there are no playoffs. 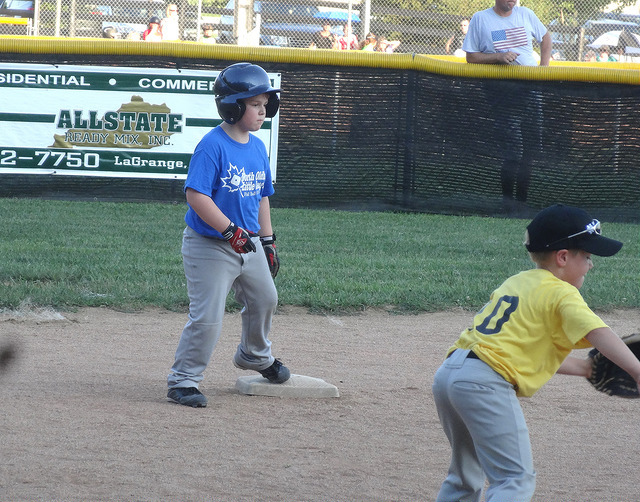 He got a chance to play some other positions, also, finding he likes to play some infield. 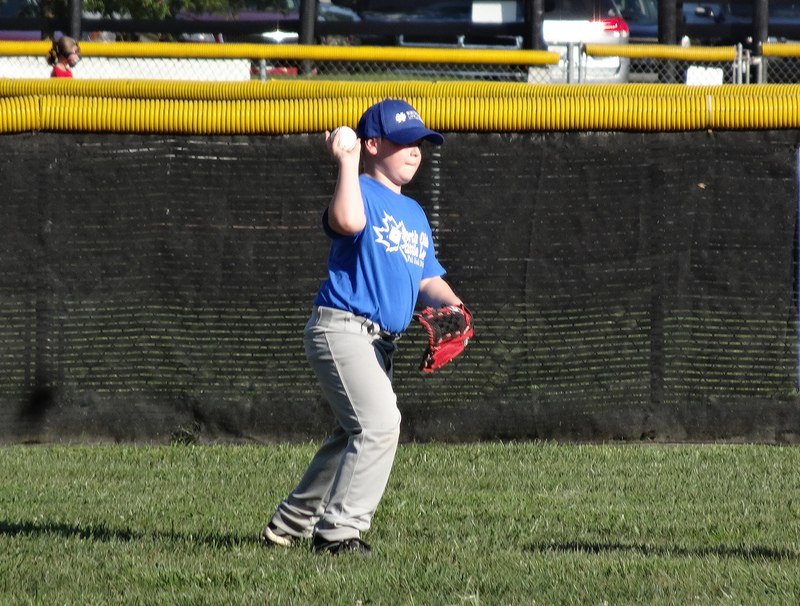 He still needs to work on his throwing mechanics a little, but he’s fielding pretty good. Brian had a solid fall season at the dish, also. 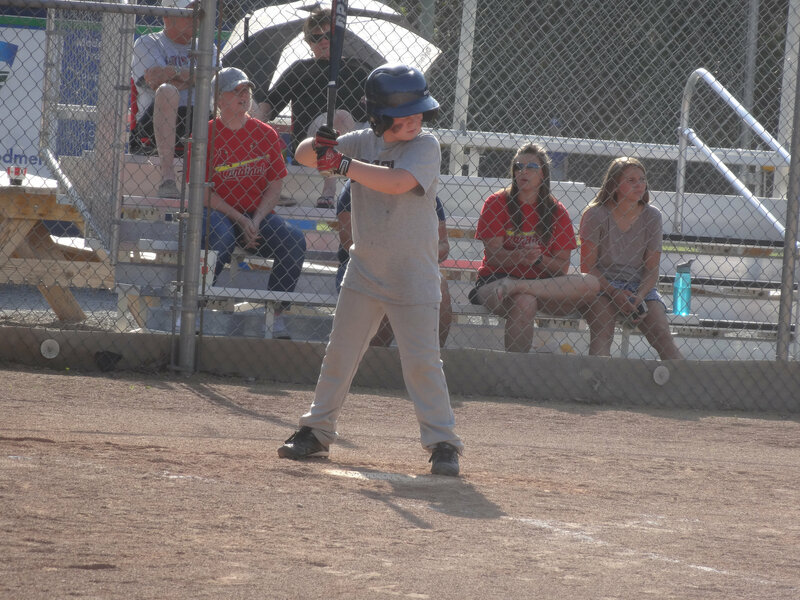 He hit well over .500, going 3-3 in two consecutive games. After that second one, he was given the game ball by his coach as player of the game. He had some good coaching this fall, as well, as they stayed very positive and stressed fun and learning above all else. 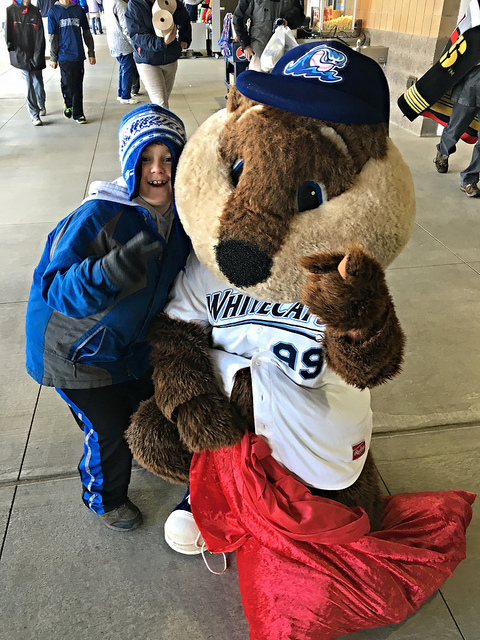 He’s excited to play next year, and spring can’t come soon enough. Walsh Park-La Grange, KY: Wow, I really love it down here! It’s amazing that my son can play a fall sport without it being soccer or football! 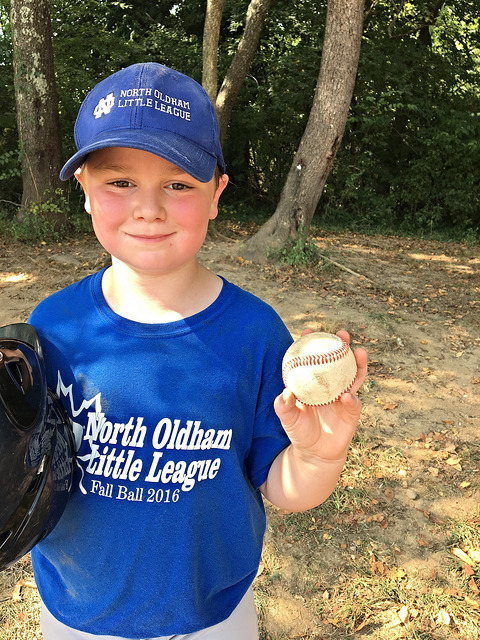 The North Oldham Little League fall ball program is a good one, and Brian is having fun so far. 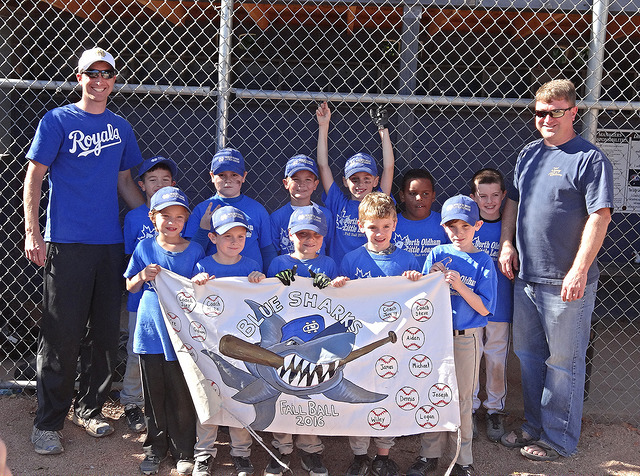 Not quite as many kids play though, so instead of team names, they just have colors, but the coaches have dubbed their team the Blue Sharks. 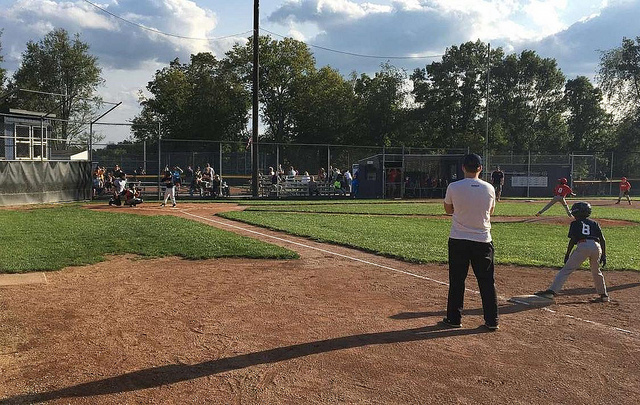 The fall league is more of an instructional league, with the kids being able to experience different positions every inning. We’re blessed again with good coaching, and they try to go above and beyond to help the kids out with the fundamentals of the game. 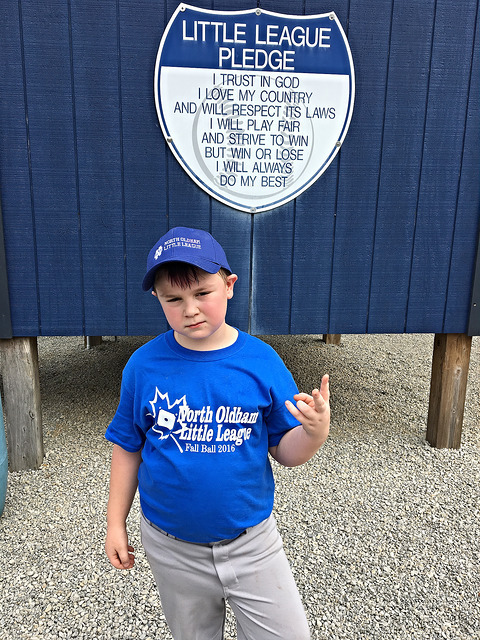 Brian and I love the Little League Pledge! 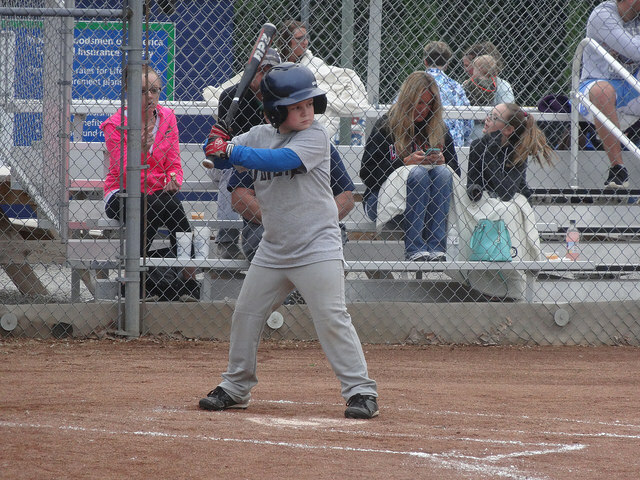 The team is 1-1 so far this season, and Brian is playing well, hitting .500 and doing well in the field. 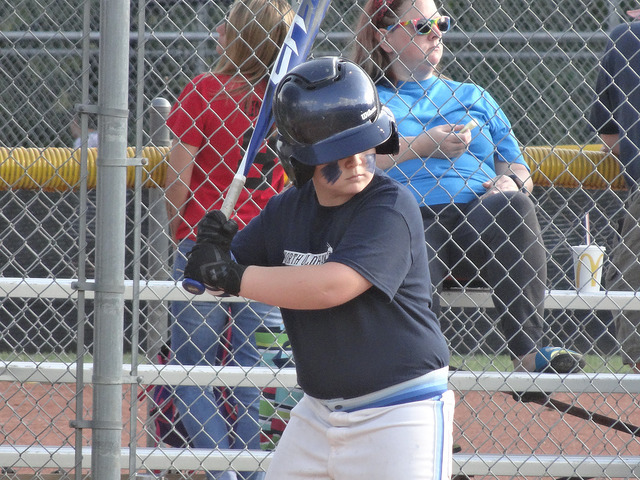 He’s been able to play a few different positions in Fall Ball, also, so it’s a little more fun and the kids won’t get bored playing in the same place all of the time. The season is just getting started, and they play through the first of October. Hopefully it might cool off just a little bit down here by then. The first couple of games the temps were still in the 90 range! The championship aside, though, I still believe this team was the best fit for Brian. 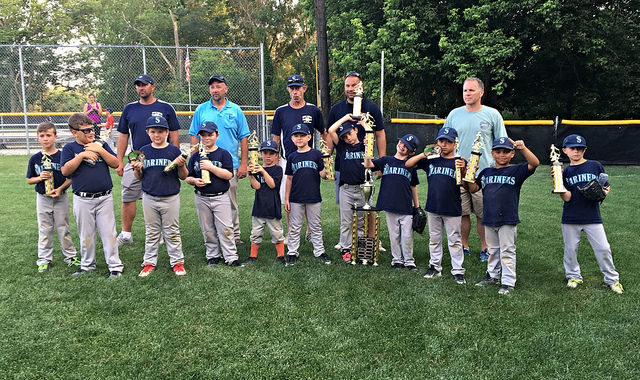 The coaches never preached winning, but focused on having the kids be positive, work hard, and have fun playing the game of baseball. From there, the winning just sort of took care of itself. 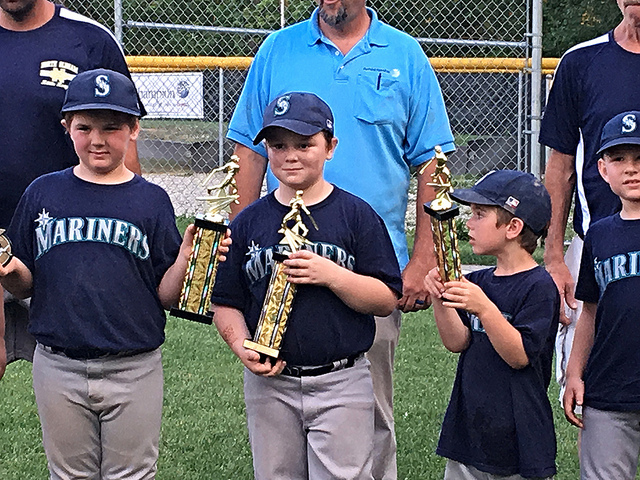 I really think Brian learned more about being part of a team and earning something you’ve worked hard for, as much as he did about the game of baseball. Their coach told the boys to enjoy this, as it may be the only championship they ever win, and he could be right about that. 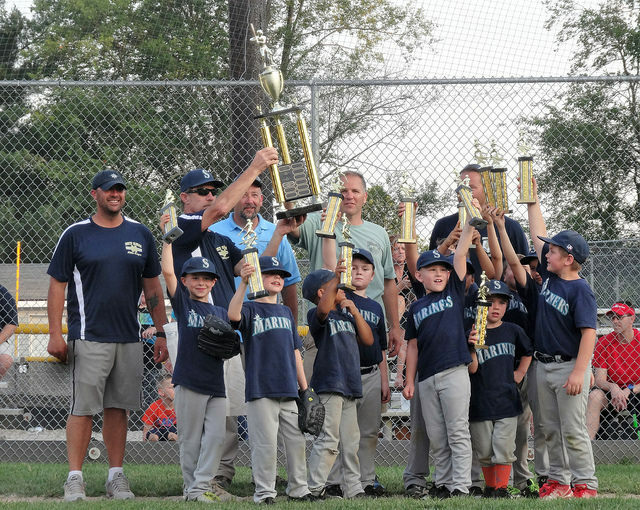 My last year in Little League was the one and only time I’ve seen glory in all my years of playing. I’m glad he’s tasted victory, but if he keeps on playing and loving this game, it’s sure to break his heart at some point. But that’s something I’ll start preparing for next year. 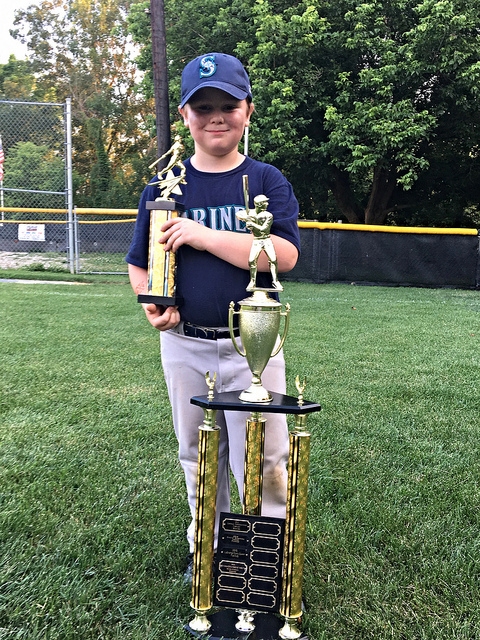 This big win sparked him to want to play Fall Ball and to keep working hard at the sport, so that gives us something to look forward to in a couple of months. Here’s a video of the final out! You can see Brian charging in from the outfield ready to celebrate!